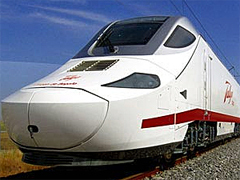 As part of a deal announced last month, Spanish train maker Talgo plans to build two high speed rail trains in the state of Wisconsin. However, where the company plans to set up shop still needs to be decided. Governor Jim Doyle says several cities are already asking him to lobby on their behalf to have the company pick them. However, Doyle says he doesn’t think that’s appropriate and he’s calling on local officials to contact Talgo on their own. Doyle says there is a huge potential for whatever area Talgo chooses. The initial order for two trains could grow to as many as 50, if everything in a proposed Midwest high speed rail proposal is approved.